It makes sense that an attractive, pleasant, and functional space is easiest to sell. But how can someone achieve that elusive state where a home appeals immediately to a buyer? 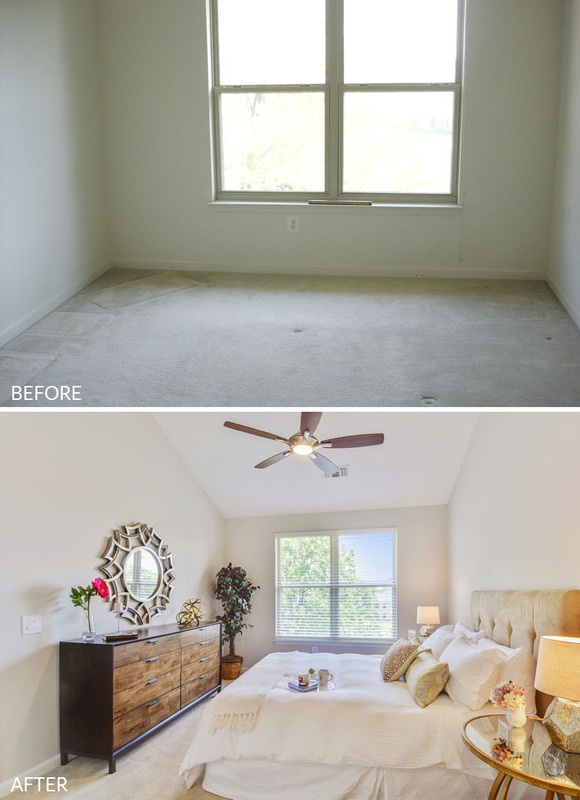 A professional home stager offered to show us some of her secrets to success. 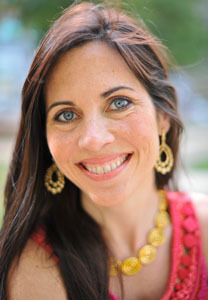 Michelle Cloney is a native Restonian and UVA grad who lives in Reston Town Center. Her mother is a local real estate agent who took her to open houses as a child and inspired her with an early understanding of the industry. For the past decade, Michelle as worked as a professional organizer and stager, and now she is also a realtor with Berkshire Hathaway. Michelle recently published a book about her staging process, called Smart. Styled. Sold. I spoke with her for a sneak peek into her system and some of her staging secrets. 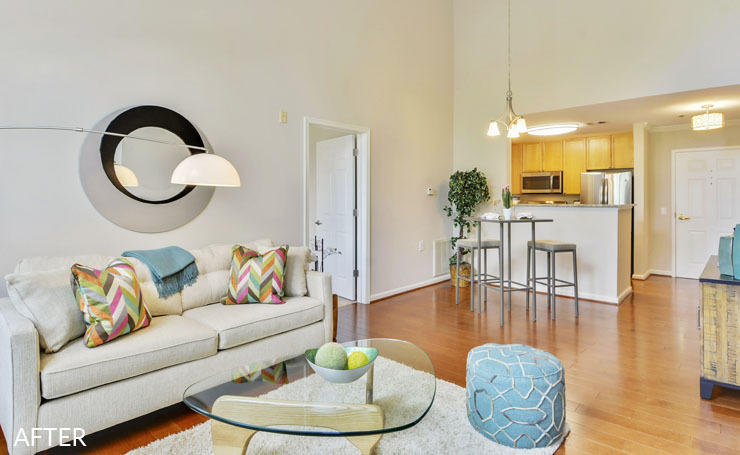 Modern Reston: What are some of the benefits of staging a home for sale? Properly staged homes sell on average 50% faster and for 10% more than unstaged comparable properties. According to the National Association of Realtors, a 1-3% investment in home staging will on average yield an 8-10% return. And given two properties of equal value, the staged property will usually sell faster and for more money. 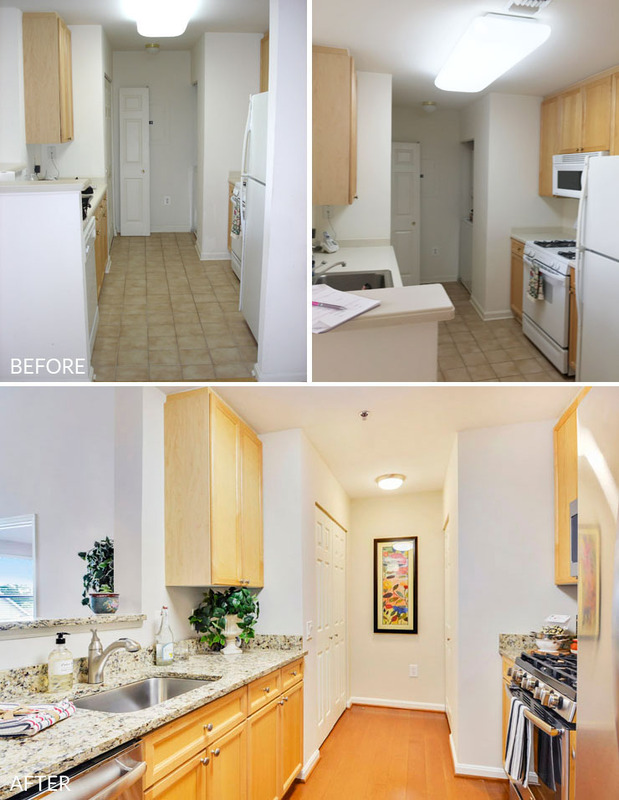 An investment in home staging will always be less than your first price reduction! Buyers make up their minds very quickly. According to recent statistics, a buyer will form an opinion on a property within ten seconds on entering it. And this is only after they have already “approved” a property after viewing it online (which is where 90% of all buyers first search for a property.) So properties today need to stand out immediately. Statistics show that the longer a property sits on the market, the lower the closing price. Selling our homes is stressful enough in itself. When a home sits on the market, it’s costing us time, money, and added stress. Staged homes tend to bring in stronger contracts with less negotiating, as there is less to negotiate. If a buyer’s emotions are heightened in a positive way and the structure is sound, they are less likely to want to go back and forth nitpicking over smaller issues. Another significant benefit of staging a home is that to do so will mean clearing much of your clutter that has accumulate before you move. This not only saves moving costs, but prevents sellers from transferring belongings that they do not use or love into their new home, their next chapter. Something that frequently happens with Home Stagers is that clients will want you to help them set up their new home because they enjoyed living in a ‘show ready’ property so much! 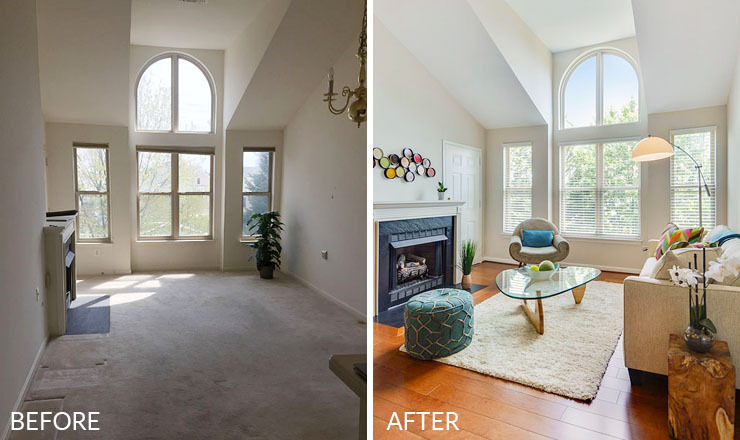 Each room needs to accomplish two things: 1) Showcase the room’s top selling features (for example, architecture, floorplan, fireplace, or windows), and 2) Appeal to our buyer’s emotions. 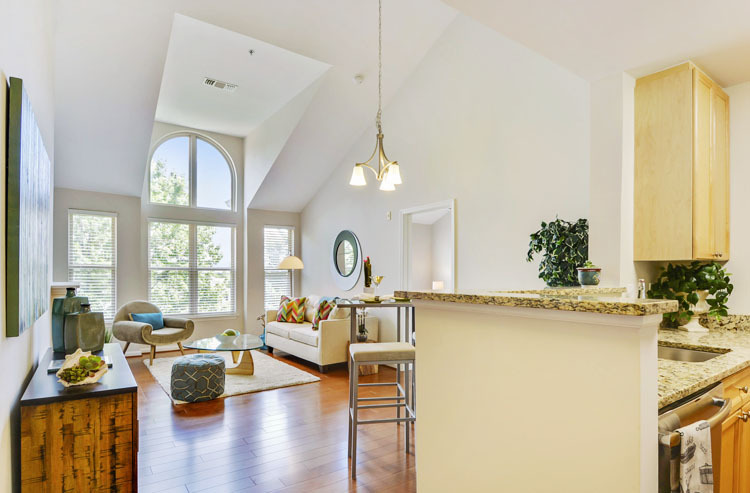 Michelle was asked to stage a condo in Reston Town Center. 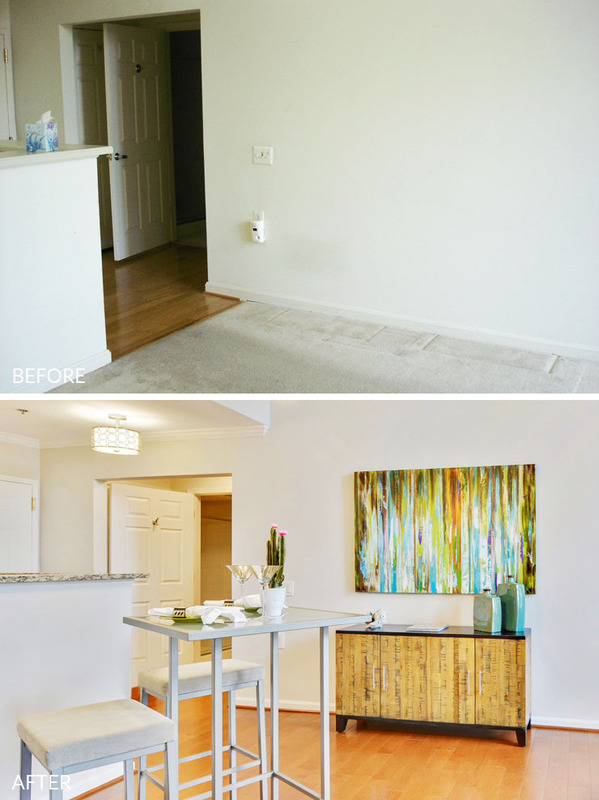 It was empty, so she had to select furnishings and upgrades that would make the space feel contemporary and bright. “I wanted it to feel like a zen oasis with a city vibe, since it was located at the Town Center yet had a view of the green hills, bike path and trees behind, which many who move to Reston seek,” she explained. She worked with Churchill Furniture Rental to furnish the entire property with contemporary furniture. Most of the accessories were from Michelle’s own inventory. Because this property was tight on space, I wanted to really accentuate the light, bright open floorplan (which is a huge selling point in today’s market). I also wanted the eye to immediately go to the living space positioned next the large floor-to-ceiling windows. You’re in the middle of the Reston Town Center, so having an immediate view to the trees and nature is a major selling point. A staging secret is that integrating seating areas in various heights gives a space depth and makes it feel larger. I chose a mix of mid-century modern and organic furniture, with plenty of textures (wood, glass, mirror, nature, soft fabrics in various materials, greenery). Something else to think about is that buyers will always be scanning the living area for a space to put their TV. The only space that could support the size of today’s flats screens was above the fireplace or to the left of it on a console. It’s not recommended to stage an actual television in a small space, so instead we hung a piece of art above the fireplace that was as a wide as a flatscreen to give the buyer perspective. For the dining portion we set up a smaller modern glass top cocktail table to create a more casual dining scenario. It didn’t make sense with the size of the space to set up a large dining area but we wanted to create a space where they could see themselves having a nice meal with enough room for guests. I chose one large piece of art on the entry which was the basis for the color scheme: a green and turquoise abstract oil canvas. The fun part of staging is you always end up moving things around. Originally it was to go above the couch, but ended up being just a bit too big, so we moved it over the console, which made much more of an impact when you first walk in! Kitchens are typically where we spend the most time, so they need to feel spacious, modern, and clean. This was a galley kitchen tight on counter space but contained new granite and appliances, so we wanted the attention to go to those bells and whistles. By placing a few intentional kitchen “scenes” by the stove, refrigerator and sink, the counter space actually appeared larger as a buyer could envision himself doing what he needs to get done when preparing a meal. To go with the urban zen feel, I used modern accessories and organic soaps and a bottle of bubbly lemon water to appeal to the taste buds. And greenery. It is essential to have form of greener, real or artificial, in each room. This is where we care for our bodies and needs to invoke all the senses that we associate with a spa, especially in the master bath. To engage the senses, we integrated a lot of fluffy white towels, a white textured shower curtain, fresh colorful and organic soaps and candles, greenery and contemporary, fresh artwork. The bathrooms all included new granite, fixtures, and paint. 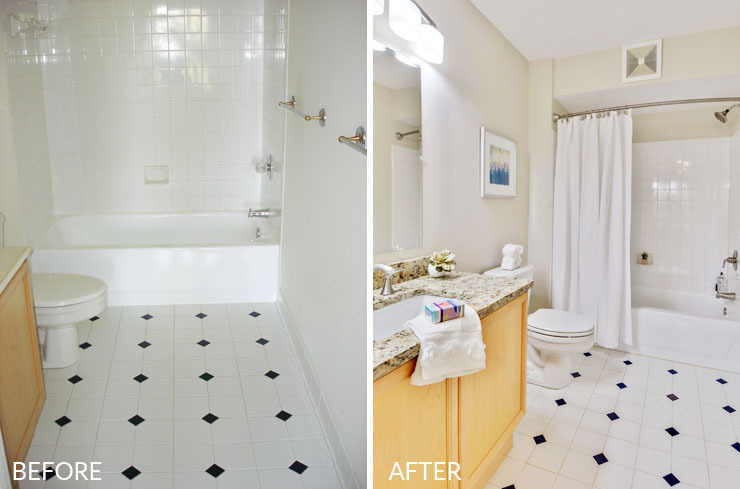 Since they were tight on space, they needed to feel spacious, up-to-date, and clean. When staging a bedroom, you always want it to function as a private sanctuary for the purposes of rest and relaxation. It had vaulted ceilings, so we wanted it to feel spacious yet cozy. The only furniture needed was a queen bed (ideal for staging), two nightstands and a dresser. We didn’t use any art – just a lot of luxurious, soft textures as you would find in a hotel — all white bedding, textured headboard, soft beige throw, a tray including anything you might like in a bedroom like a flower, a glass of water and a candle, and then furniture in a mixture of woods and glass accessorized in gold finishes. 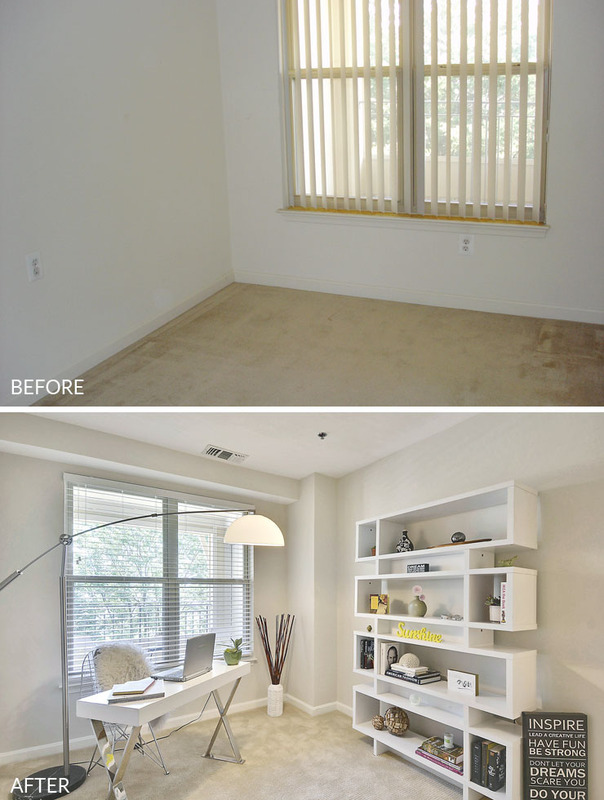 We determined that our buyer would likely be a working professional or couple, so we decided to stage the second bedroom as a home office (since it was small.) With more and more professionals working at least part time from home, a home office is becoming a desired feature on a buyer’s list. To convey an office, we used a simple contemporary white desk, floor lamp, one large piece of art as a focal point and a styled modern bookcase. A room appears larger when the desk is positioned facing the entry as it appears more commanding. This was my favorite to style! I wanted to give off the modern, working-from-home professional and integrated bright and positive imagery to convey organization and getting things done in a happy space.